The Washington Wizards have been one of the biggest surprises of the 2015 NBA Playoffs. This collection of skilled youth and wily veterans had taken its play to a whole new level in the postseason and looked like a group that could legitimately represent the Eastern Conference in the NBA Finals. 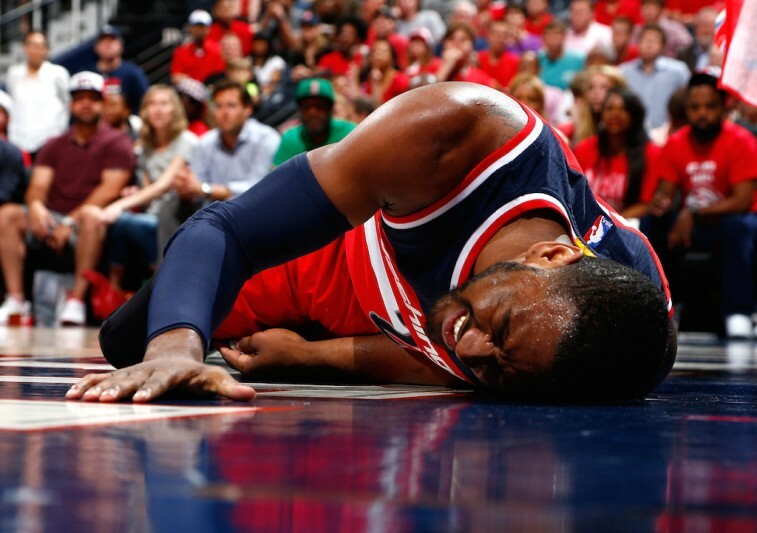 But now with the devastating news that star point guard John Wall has five non-displaced fractures in his injured left wrist and hand, all bets are off. It’s safe to say that this team is in trouble. Real trouble. This best-of-seven series with the Atlanta Hawks may be tied at one game a piece, but with Wall on the bench during Game 2, it became even more evident that Washington is not the same team when its All-Star is not on the floor. Wizards coach Randy Wittman is well aware of this fact. “With the swelling and the stuff it has been, we knew maybe there’s not good news there,” said Wittman. “We will see as we move forward what that actually means. He is still consulting with doctors. It’s still pretty swollen. He can’t do anything let alone if he didn’t have any broken bones. It’s one thing to try and prepare to play without your best player, but it’s a whole ‘nother story to actually go out and do it. The Wizards are well aware that if Wall is unable to return this postseason, then everyone will have to step up their game. That’s nice in theory, but here’s the simple truth: This team cannot win without Wall. There’s only one way to describe John Wall’s postseason play so far: masterful. In the five games he’s been on the floor, Wall’s logging an average of 38.2 minutes per contest, and putting up 17.4 points, 12.6 assists, and 4.6 rebounds in the process. If you’re looking for an historical comparison, you’re in luck, these numbers have been put up before — by Magic Johnson and John Stockton. That’s it. This postseason, Wall’s production is on par with two of the greatest point guards to ever play the game. 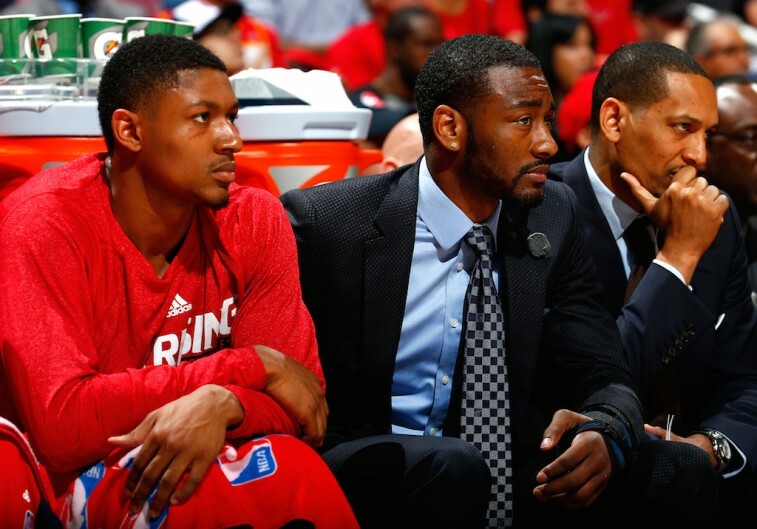 The Wizards can’t simply replace that by collectively stepping up their game. This group needs its point guard. And the numbers show that as well. According to ESPN Stats & Info, in Wall’s five-year career with the Wizards, the team is just 10-40 without him in the lineup (including Game 2 against the Hawks). In these playoffs, Washington 5-0 with the former Kentucky Wildcat on the floor. During these games, the Wizards have an offensive efficiency of 115.7, are shooting 49% from the field, and have 2.0 assist to every turnover. However, during Wall’s absence, the results were much different. Washington’s offensive efficiency was 96.0, the team shot just 40% from the field, and it averaged 1.4 assists per turnover. He is that important to this group’s success. In fact, his 12.6 assists per game have led to an average of 30.8 points per contest — the most by any player in the playoffs. This was a breakout postseason for Wall, and it led to a breakout postseason for the Washington Wizards. If he’s finished, then so is this team. The Washington Wizards had been the Cinderella-story of the 2015 playoffs. They destroyed the higher-seeded Toronto Raptors in four games in round one. They went into Atlanta in Game 1 of the conference semifinals and stole home-court advantage from the East’s top seed. They accomplished all this because the best player on the team was playing was also playing like the best player in the series. Sometimes the numbers don’t always tell the whole story. But in this case, they do. The Washington Wizards are not the same team without Wall on the floor — and they never will be. We really believed that this team had a chance to make moves this postseason. But the Wizards were always only going to get as far as their star player could take them. If Wall’s playoff run is over then, unfortunately, the Washington Wizards will soon follow suit. This is indeed a tough break all around.